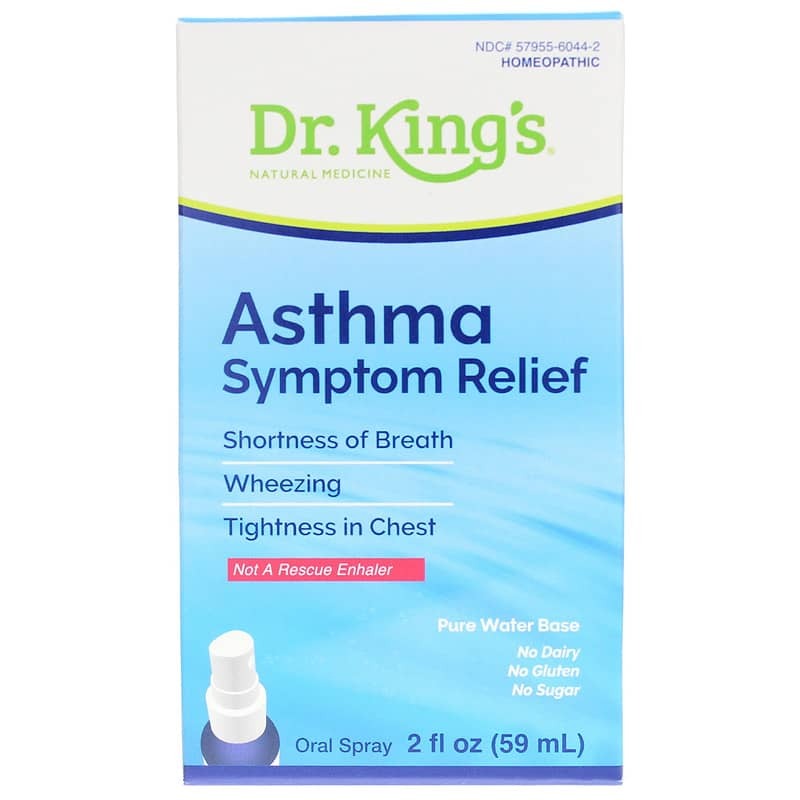 King Bio Asthma Symptom Relief is a homeopathic spray designed to complement, not replace, standard medical care in helping to provide relief for minor asthma symptoms. Asthma Symptom Relief may help address many of the underlying causes behind asthma. It may be used both preventively and as a temporary reliever for minor asthma symptoms. Asthma is a chronic condition that affects the air passageways of the lungs. During an attack, your airways narrow and swell and generate additional mucus. This can make it hard to breathe and lead to coughing, wheezing, and shortness of breath. Statistics from the American Lung Association, the Centers for Disease Control and Prevention, and the National Institute of Allergy and Infectious Diseases report that 23 million people in the US have asthma, including 7 million children. Asthma Symptom Relief uses 11 HPUS( Homeopathic Pharmacopoeia of the United States) homeopathic active ingredients in three powerful potencies of 10X, 30X, and LM1. 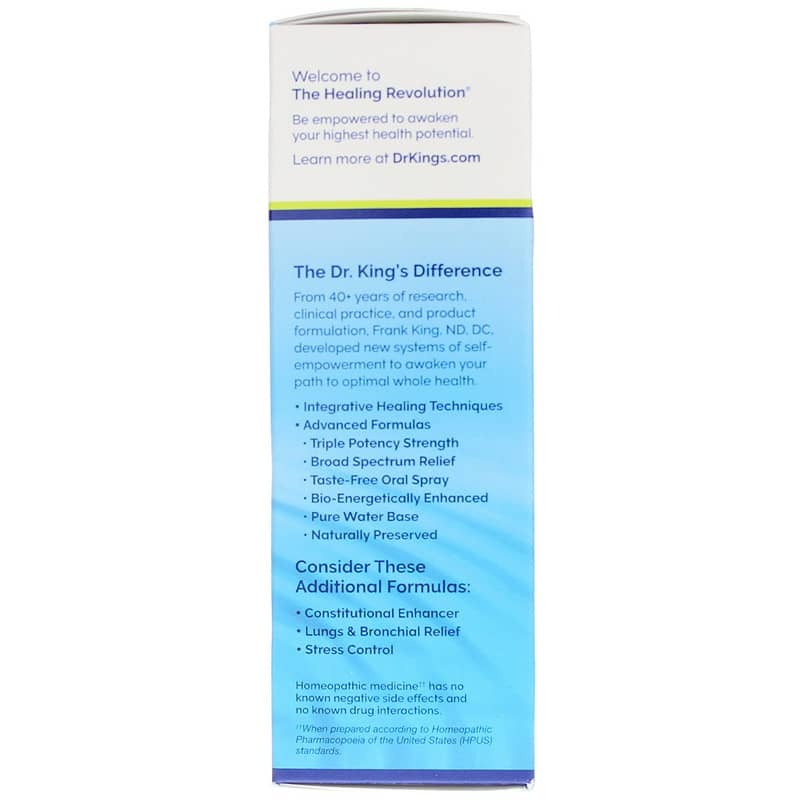 King Bio believes that this approach allows the body to use exactly what it needs from the formula, in order to restore balance and health. To use this homeopathic spray, you just need to spray the dose directly into the mouth. An adult dose is three complete pump sprays. King Bio says this product may stop an attack as quickly as an inhaler in some instances. However, it recommends working with your prescribing physician before undertaking any changes in medication, as an inhaler may also be needed at times. Equal volumes of each ingredient in 10X, 30X and LM1 potencies. Other Ingredients: Bio-Energetically Enhanced taste-free, pure water base, Carya ovata bark extract (hickory) citrus extract*, Lonicera japonica (honeysuckle), polylysine (natural ferment), steviol glycosides (stevia). Contains NO: alcohol, dairy, gluten, sugar. Initially, depress pump until primed. Spray one dose directly into mouth. Adults: 3 sprays, 3 times per day. Use additionally as needed, up to 6 times per day. Children 2 to 12 years: 2 sprays, 3 times per day. Use additionally as needed, up to 6 times per day. Asthma can be a life-threatening disease. 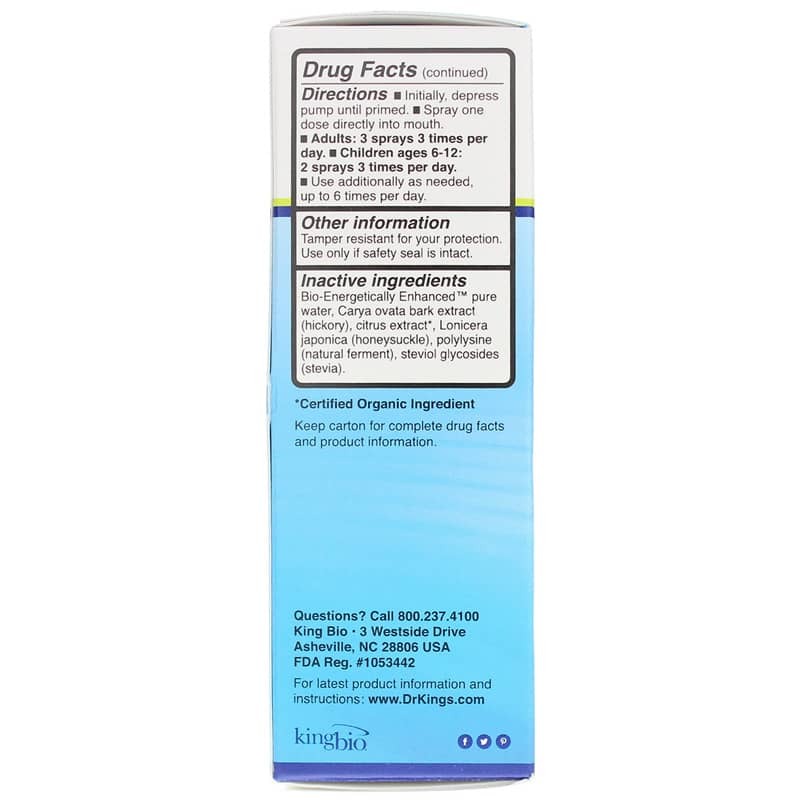 this product may be used to complement, not replace, standard medical treatment. This product is not intended as a substitute for standard medical care. If you have ever been hospitalized for asthma, consult your physician before using any over-the-counter product to treat symptoms. If symptoms persist or worsen, seek advice of physician. If you are pregnant or nursing, please consult your physician before using this product. Keep out of the reach of children. 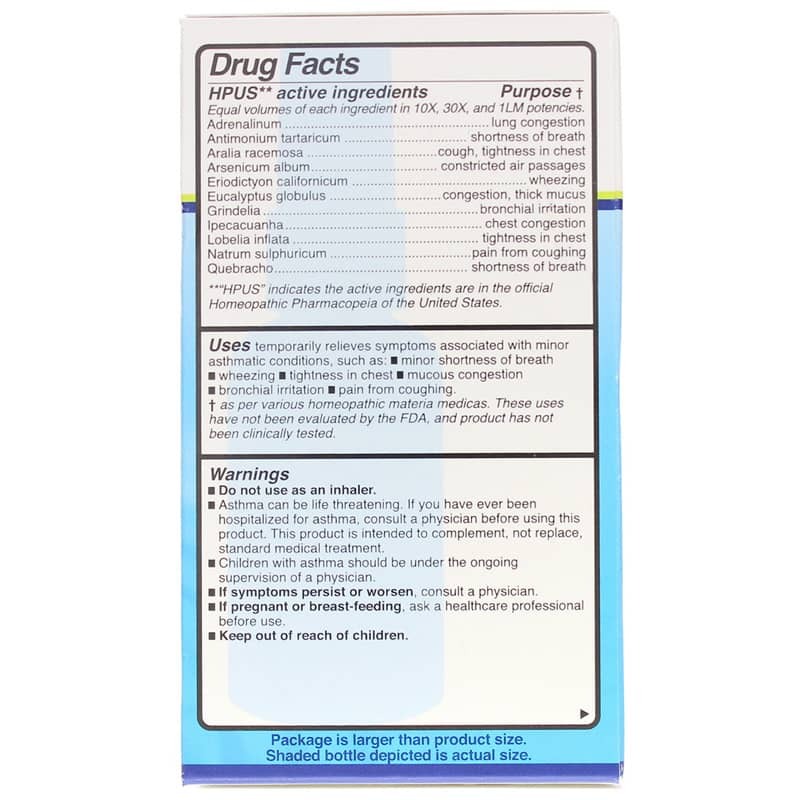 Overall a good product but check with your physician prior to using. I've been useing this spray for a few years. It took a few weeks to see results but since they did a re call on it I've noticed everything it helped with. It almost completely stoped all my asthma symptom. The violent chest cough, the shortness of breath, the asthma attacks. Everything asthma symptom I had it took care of and got under control. It's honestly the best thing g I've ever tried.